I am not a dog person. I am a horse person. I did not inherit this. It seems to have just settled upon me. My grandfather, Quentin, grew up on a farm and liked the mules, but he left at 16 and worked the night shift in a St. Louis Post Office most of his life. He is the closest link I can think of. My mother said beginning when I was two I would look out of the window of the car, searching for horses…..so, however it happened, I am a horse person. I started riding seriously at 14, trained my first show horse at 16 (a horse I leased), begged, borrowed and bummed horses whenever I could, had a race horse trainer’s license and finally started my own official, tax-paying training business (after being under the table for a while). In my “spare” time I teach biology full-time at a local community college. Oh, modesty! She left out about the part about All Round Sundown, which pretty much sums up the philosophy around here–good stuff everywhere you turn. 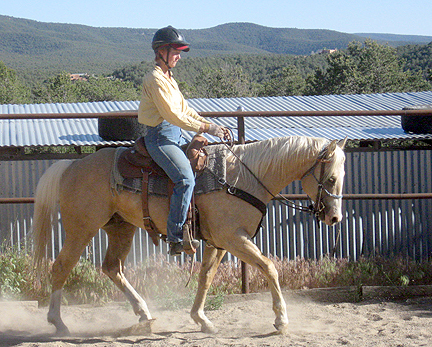 At three years old, All Round Sundown was packing out (overnights, hobbles, picket line, ponying)–and at four she won a world and national title in western riding, placed top five in hackamore/snaffle bit reining, and top ten in trail. There’s your all-rounder–with a 14.2hh low-cost girl competing against giant leggy western pleasure horses. So if you enjoy horses or you like a fresh and amusing voice–or if you don’t know what 14.2hh means and maybe you should if you want to write that scene!–then this is gonna be fun!